As an athlete and member at Arena Ready, part of your membership includes free access to Beyond the Whiteboard, the leading planning and progress reporting tool for CrossFit workouts and healthy lifestyles. The site has recorded over 4 million workout results worldwide, and it serves as a searchable analytical tool for folks to record and monitor their progress during their journey toward increased fitness. As an athlete at Arena Ready you're encouraged to record your workout times/loads/rounds/reps utilizing the pre-populated WOD templates we load into the system - you simply log-in and enter your results. You can even enter your meals, weigh-ins, goals, pictures, videos - you get the drift. We've linked BTWB in the righthand margin of this blog page so that it's easy for our athletes to remember to log their information and results. The system isn't perfect, but it's pretty darn good, fairly robust, and it improves with each iteration they develop. Most of our athletes use BTWB regularly (as they should), and those of you that don't tend to hear it from us on a regular basis (Mike B, stop fixing your hair and enter your freakin' WOD time... the salad looked really nice today BTW, very full and textured). If you have an iPhone it recently became even easier to record and monitor your progress with the BTWB app! It's free for folks who are already BTWB members (i.e. all of you Arena Ready members) and can be downloaded in your iPhone's app store or on the inter-webs here. 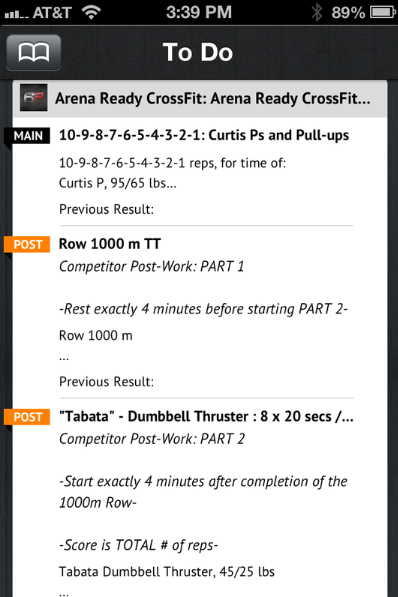 The screenshot above shows today's WOD lineup, including Competitor Post-Work, displayed on my iPhone. If you're thinking, "but what if I don't have an iPhone, Rob?" Well, your next huge banking deal or closed enterprise sale should ease the pain of having to use the 'Berry like some modern-day Patrick Bateman at Pierce & Pierce. That's not really an answer, I know, but hey I empathize with you - I used to be that guy too. And if you use a Droid by choice then, well, maybe Patrick Bateman should take you on a date and show you his Genesis album collection. I can almost hear everyone under the age of 30 collectively saying, "what in the world is he talking about now?!" Log your workouts people, that's what. BTWB is available to you, so be smart and use it. Hydrate, rest, eat some great food, and enjoy the rest of your weekend!